A Castilian court physician and chief rabbi of the fifteenth century; exact dates of birth and death unknown. He was presumably related to Don David Alguadez, a brother-in-law of the treasurer of Portugal, Don Juda, and to Salomon Alguadez, who lived in Peralta, in Navarre, in the year 1414; perhaps also to Abraham Alguadez, who resided in Vitoria in 1461. 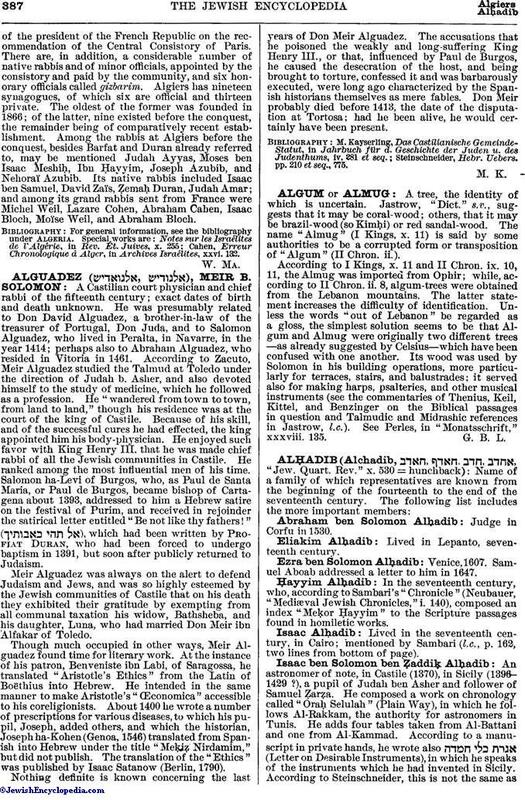 According to Zacuto, Meir Alguadez studied the Talmud at Toledo under the direction of Judah b. Asher, and also devoted himself to the study of medicine, which he followed as a profession. He "wandered from town to town, from land to land," though his residence was at the court of the king of Castile. Because of his skill, and of the successful cures he had effected, the king appointed him his body-physician. He enjoyed such favor with King Henry III. that he was made chief rabbi of all the Jewish communities in Castile. He ranked among the most influential men of his time. Salomon ha-Levi of Burgos, who, as Paul de Santa Maria, or Paul de Burgos, became bishop of Cartagena about 1393, addressed to him a Hebrew satire on the festival of Purim, and received in rejoinder the satirical letter entitled "Be not like thy fathers!" ( ), which had been written by Profiat Duran, who had been forced to undergo baptism in 1391, but soon after publicly returned to Judaism. Meir Alguadez was always on the alert to defend Judaism and Jews, and was so highly esteemed by the Jewish communities of Castile that on his death they exhibited their gratitude by exempting from all communal taxation his widow, Bathsheba, and his daughter, Luna, who had married Don Meir ibn Alfakar of Toledo. Though much occupied in other ways, Meir Alguadez found time for literary work. At the instance of his patron, Benveniste ibn Labi, of Saragossa, he translated "Aristotle's Ethics" from the Latin of Boëthius into Hebrew. He intended in the same manner to make Aristotle's "Œconomica" accessible to his coreligionists. About 1400 he wrote a number of prescriptions for various diseases, to which his pupil, Joseph, added others, and which the historian, Joseph ha-Kohen (Genoa, 1546) translated from Spanish into Hebrew under the title "MeḲiẓ Nirdamim," but did not publish. The translation of the "Ethics" was published by Isaac Satanow (Berlin, 1790). Nothing definite is known concerning the last years of Don Meir Alguadez. The accusations that he poisoned the weakly and long-suffering King Henry III., or that, influenced by Paul de Burgos, he caused the desecration of the host, and being brought to torture, confessed it and was barbarously executed, were long ago characterized by the Spanish historians themselves as mere fables. Don Meir probably died before 1413, the date of the disputation at Tortosa; had he been alive, he would certainly have been present. Steinschneider, Hebr. Uebers.pp. 210 et seq., 775.